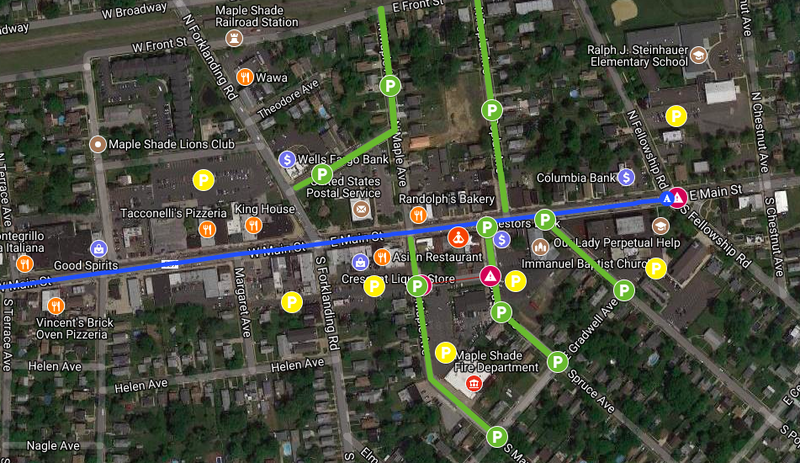 If you make a left on Poplar Ave. you can park in parking lot of Lady Of Perpetual Help or on the street. If you make a left on Spruce Ave. you can park in parking lot of Immanuel Baptist Church or park on Spruce Ave. If you make a left on South Maple Ave. you can use the parking lot of Maple Shade fire department or park on the street. There is also a parking lot on the left of South Maple behind Cafe Fontana’s. If you make a left on South Forklanding Rd, go down to the parking lot on your left before Main St. There is also some parking behind 39 Below hairstyles/Qd Nails. Park on Front St. along the railroad side of the road. Turn left on North Fellowship for street parking and parking lot for Ralph J. Steinhauer Elementary School. Turn left for street parking on North Poplar Ave. Turn Left on North Forklanding Rd. Right on Brubaker Lane to a parking lot on the left by Acme on Brubaker Lane. Make right on Wallace Ave for street parking. On Wallace Ave. there is parking on right at Maple Shade Post office parking lot or there is street parking on North Maple turning left at the Post Office. Rt 38 to Mill Rd in Maple Shade. If you make a left on Spruce Ave. you can park in the parking lot of Immanuel Baptist Church or park on Spruce Ave. If you make a left on South Maple Ave. there is the parking lot of Maple Shade fire department or you may park on the street. There is also parking lot on the left of South Maple behind Cafe Fontana’s. Left on East Center Ave. If you make a left on Poplar Ave. you can park in the parking lot of Lady Of Perpetual Help or on the street. If you make a left on South Forklanding Rd., go down to parking lot on left before Main St. There is some parking behind 39 Below hairstyles/Qd Nails.